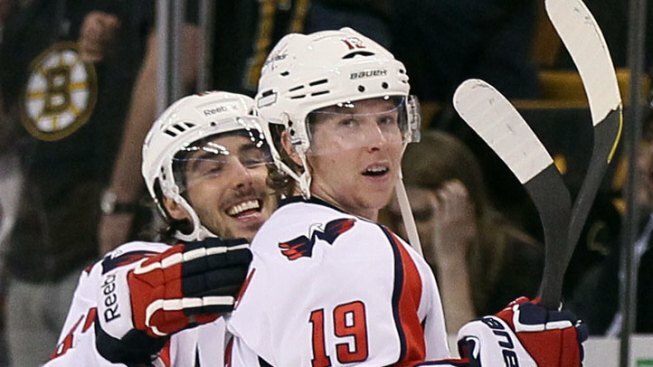 Washington gets split and heads back to D.C.
Nicklas Backstrom celebrates his 2OT winner against Boston in Game 2. Game No. 2. Overtime No. 2. And finally goal No. 2 for the Washington Capitals. Yes, it took a very long time for the Caps to reach that mark, but it was well worth it. A fluttering wrist shot from Nicklas Backstrom squeezed under the arm of Boston Bruins goaltender Tim Thomas to give Washington a 2-1 win in double-overtime of Game 2. The teams now return to D.C. with a split series for Game 3 at 7:30 p.m. Monday. Backstrom's winner came three minutes into the second OT. Boston defenseman Johnny Boychuk whiffed on a clearing attempt in the corner to the right of Thomas, allowing Marcus Johansson to pick up the loose puck and throw it into the slot. Backstrom fired the puck as it was on edge, and it found a way between Thomas's arm and body and into the net. The series is perhaps going just as the Caps imagined it. They're playing well in the defensive end despite playing there too much in Game 1. They've limited the Bruins to just two goals in two games. And they've taken away home-ice advantage with a huge win in Game 2. You don't draw it up much better than that. For coaches, the playoffs oftentimes more about adjustments than locker room pep talks. What a coach does between games or periods could be just as important as firing a team up with a profanity-laced rant. Dale Hunter made several key adjustments for Game 2 against the Bruins. One, he tightened up his team's defense in order to cut down on Boston's scoring chances. And two, he found a way to get Alex Ovechkin on the ice against someone other than Zdeno Chara and Dennis Seidenberg. The Caps were more balanced in the shot category, and Ovechkin finally got his name on the scoring sheet with an assist on Washington's first goal of the postseason. The Caps broke the seal in the second period when what looked like a harmless fling of the puck by Ovechkin toward the Bruins net deflected off of defenseman Greg Zanon and fluttered in the crease. Zanon decided to let goalie Tim Thomas pounce on it, but before he did Troy Brouwer slipped his stick into the mix and poked it under Thomas and into the net. The goal ended Thomas' shutout streak at 161 minutes and some change, and gave Washington a major boost in the series. Yes, Virginia, it is possible for the Caps to get a puck past Timmy Thomas. The Brouwer tally carried the Caps into the third period. While Hunter made the right adjustments, the Bruins coaching staff didn't tinker with what worked in Game 1. Granted, what worked only netted them one goal in OT in Game 1. Instead of making Braden Holtby move side-to-side more to open up the scoring chances, they continued to fire pucks straight on, and Holtby was up to the task. He allowed few rebounds and kicked most pucks into the corners, providing little in second-shot opportunities. But this is the playoffs, and some hard work and determination finally paid off for Boston. The Bruins tied it up with 7:47 to go in the third. A shot by Brian Rolston from the left wing boards was deadened by Jeff Schultz's shin pad right in front of the Caps' net. Schultz couldn't track it down, but a streaking Benoit Pouliot did. He beelined for the puck and backhanded it into the net before bowling over Holtby. It took a complete OT period and three minutes more of a second for one time to finally prevail. And the Caps will take it. Game 3 will be shown on the NBC Sports Network.